58. Terrorist whistle - stop whistle terrorism! 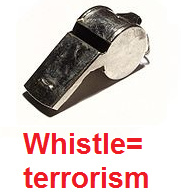 English whistle terrorism since 1878 in sports, on crossings, train stations and in the army etc. Joseph Hudson set up J. Hudson & Co in Birmingham, UK in 1870. With his younger brother James, he designed the 'Acme City' brass whistle. This became the first referee whistle used at association football matches during the 1878–79 Football Association Cup match between Nottingham Forest and Sheffield. Prior to the introduction of the whistle, handkerchiefs were used by the umpires to signal to the players. In 1883 he began experimenting with pea-whistle designs that could produce an intense sound that could grab attention from over a mile away. His invention was discovered by accident, when he accidentally dropped his violin and it shattered on the floor. Observing how the discordant sound of the breaking strings travelled (trill effect), Hudson had the idea to put a pea in the whistle. Prior to this, whistles were much quieter, and were only thought of as musical instruments or toys for children. After observing the problems that local police were having with effectively communicating with rattles, he realised that his whistle designs could be used as an effective aid to their work. Cross, David (2011-02-17). "On the Beat in Birmingham - Rules and regulations". BBC. Retrieved 11 March 2014. Police whistles came much later; the early Victorian constable would have carried a small wooden rattle. Taylor, J. "The Victorian Police Rattle Mystery" The Constabulary (2003) Archived February 18, 2010, at the Wayback Machine. Hudson demonstrated his whistle to Scotland Yard and was awarded his first contract in 1884. Both Ratchet rattles and whistles were used to call for back-up in areas where neighborhood beats overlapped, and following their success in London, the whistle was adopted by most police in the United Kingdom. This police whistle monopoly gradually made Hudson the largest whistle manufacturer in the world, supplying police forces and other general services everywhere. His whistle is still used by many forces worldwide. His design, was improved as the 'Acme Thunderer', the first ever pea whistle, which remains the most used whistle in the world; for train guards, dog handlers and police officers [and for destructive armies blowing brains out of the heads of the soldiers]. From the 1880s and 1890s, J. Hudson & Co began facing greater competition, as other whistle manufacturing companies were established, including W. Dowler & Sons, J. Barrall, R. A. Walton, H. A. Ward and A. De Courcy & Co. In 1987, Ron Foxcroft released the Fox 40 pealess whistle, designed to replace the pea whistle and be more reliable. Conclusion: whistle is terrorism of machismo and wars - stop the whistle terrorism! Whistles are damaging ears and nerves. When whistles are making noise for over a mile then this is clear TERRORISM. The whistles are serving only for militarizing a society and whistles are mostly abused as a play of the policemen when it's not at all needed and when there is no danger at all. So the whistle is an instrument of machismo. And where is needed a big signal as in the train stations it can be replaced by a bell or a beautiful loudspeaker signal. Also the whistle in sports is militarism and can be replaced. When the whistle was invented in 1878 there was no sociology nor analytic psychology nor self-exploration yet. 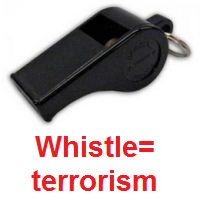 Whistle terrorism destroys all feelings empathy and mental work and is even a stimulus to behave badly against the whistle because whistle terrorism provokes counter-terrorism. We have to see this clearly: since the invention of the whistle the wars in the world have NOT stopped, but world wars were organized also thanks of the terrorist whistle (!). We have to see: the average of education is much higher now in 2017 than it was in 1878. So it's clear: the whistle is NOT NEEDED ANY MORE. Stop whistle terrorism - save ears and nerves.